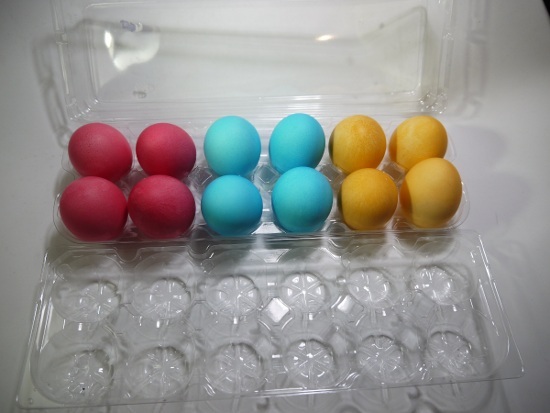 It's possible to buy special kits to dye eggs for easter but here is a very simple method that produces beautiful eggs and works with standard liquid food coloring from the supermarket. For best results I recommend to use white eggs. Prepare a solution to dip the eggs into: Fill into a large glass bowl or old pickle jar 1/4 liter of water, 1 table spoon of vinegar (5%), 8 drops of food coloring. Note that food coloring stains cloth, tables and kitchen counters. It's a good idea to put a news paper on the table to protect it. Set the eggs into the prepared dye solution and let them dye for 1-4 hours dependent on how strong you want the colors to be. Prepare a large bowl with crumpled up news paper. This is to dry the eggs. Take the eggs out of the jars with a large table spoon and set them on to the crumpled up news paper to let them dry. Boiled eggs must be stored in the fridge and they keep for a week and probably longer (I have not tested how long they keep). Enjoy your bright colored eggs.